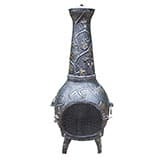 Cast iron chimineas are a present-day variant of old clay chimeneas with the same classic design. The difference is that they carry more shapes and features, however, the cast iron will offer a higher durability. Chiminea cast iron versions from today stay with the same very rustic appeal, yet they are more heavy-duty than their clay cousins and come with a higher need for annual maintenance. 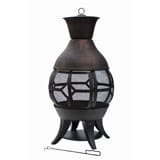 Whether you’re using a cast iron chimenea for the occasional backyard gathering, as a patio heater or just as a decorative piece, they are a great addition almost to any place you own. Removable neck w/grilling area, removable rain lid, spark arrestor insert. Hinged mouth spark screen, Cast iron bottom grate, carry handles for easy arrangement. Free screen and wood tool, bottle of touch up paint. Approx. 22 x 22 x 52 inches. Weight 178 pounds. Handles a full size fire log and burns cleaner then a fire pit, due to efficient drafting. Durable cast iron construction with a fiberglass lining to lock in heat. Include outdoor fireplace and oven, a stainless steel barbecue grill hidden behind the sunburst. Removable ash draw for easy cleanup, hinged spark guard screen door. Size 16 x 18.5 x 44 inches. Weight 130 pounds. Durable cast iron construction, weather-resistant powder coating finish. Fire poker included. The mesh spark screen with geometric pattern keeps embers contained while providing a great view of the entire fire pit. Assembled size: 23.42 D x 42.52 H inches. The perfect centerpiece for a restaurant or outdoor patio area. Handles a full size fire log. 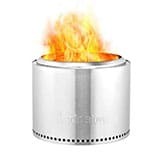 Safe clean burning single opening traditional chiminea, spark arrestor neck insert. Removable rain lid, carry handles for easy arrangement. Free screen and wood tool, bottle of touch up paint. Cast iron CH027CI. Approx. 52 x 22 inches, weight 174 pounds. 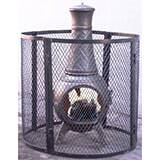 With round wire mesh screening design enables all direction visibility fire at chiminea. Chiminea ideal for use with firewood and artificial logs. Sliding door and ash tray enables users to add fuel or remove ash with ease. 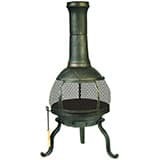 Chiminea firepit features heavy-duty cast iron construction. PVC cover not included. Product dimensions	22 x 45 inches, item weight 53 pounds. Highly functional, extra large chiminea outdoor fireplace design. Weighing almost 200 pounds it is one of the heaviest models. Has a removable top for outdoor grilling, pizza, or baking bread. Hinged mouth screen door and built in carry handles. Heavy cast iron construction. Dimensions 18 x 22 x 52 inches. Adds beauty, style and functionality. Durable cast iron construction. Hardened powder coat finish in antique pewter for years of beauty. Easy to follow assembly instructions and product care information. Stainless steel; galvanized or brass assembly hardware. Fade; chip and crack resistant. Can fit three to five logs or use charcoal for grilling. Approx. 20 x 23 x 53 inches, weight 168 pounds. Great for burning wood and artificial logs. Designer embossed cast iron construction and high temperature paint finish. Full 360 degree view of fire with fine wire mesh spark screen. Large sliding door for adding fuel and an ash catcher for easy cleanup. Cap on top to keep out rain. Log grate and fire tool included. Dimensions 21 x 21 x 51.6 inches with a weight of 75 pounds. For outdoor use only. Cast iron construction for long lasting durability. Hardened powder coat finish in antique bronze for years of beauty. Easy to follow assembly instructions and product care information. Stainless steel, galvanized or brass assembly hardware. Fade, chip and crack resistant. Dimensions 20 x 23 x 53 inches, item weight 168 pounds. 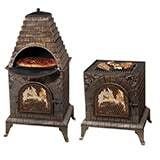 Safe clean burning single opening traditional chiminea, cast iron grilling/baking insert. Removable rain lid, spark arrestor neck insert, carry handles for easy arrangement. Removable top, free screen and wood tool, bottle of touch up paint. Regular maintenence will ensure years of use. Great for commercial settings such as campgrounds, skating rinks, and restaurants. Cast iron approx. 22 x 22 x 44 inches, 172 pounds. Cast Aluminum Garden Style Chiminea with Gas kit available here. Unique pyramid tower design diverts smoke upwards away from guests. Unique design will become centerpiece to your favorite outdoor spot. Clever tab and slot design makes assembly a breeze. Covered storage protects firewood from moisture to make sure the Pyro Tower is ready to work whenever you’re ready to relax. An optional accessory cooking kit allows you to grill, smoke, and bake in the pyro tower. Dimensions (without pedestal) 32 x 25 x 42 inches with a weight of 208 pounds. Features durable cast aluminum in an antique pewter heat-resistant hardened powder finish, so you can enjoy cozy fires for years to come. The unique design makes this chimenea a charming centerpiece for any outdoor space. Dimensions: 45 x 25 x 20 inches, 139 pounds. It’s the fire pit of the future. 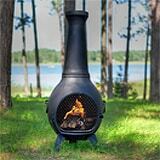 The Solo Stove Bonfire is just about the best solution to most of the problems you may have with your usual fire pit setup and it’s impressively high-tech. The technology behind this amazing fire pit helps burn logs completely while minimizing smoke. You’ll be able to get a fire very quickly, nearly smokeless, with amazing looking flames, a great amount of heat, and almost no ash. Click here for a full review. The right English spelling is chimenea and is pronounced chim-ih-nee-ah. It’s defined as a freestanding front-loading fireplace or oven with a bulbous body and a vertical smoke vent or chimney. Common misspellings are chiminea and chimnea. Chimenea originated in Mexico many hundreds of years ago and was traditionally made from clay. They were used as both a source of heat and also a means to cook or bake. The Spanish translation of chiminea literally means chimney. Today in America the word is still frequently spelled with an i instead of an e. Although clay is still popular. there are modern cast iron and steel alternatives available now. Clay, Cast Iron or Steel Chimnea? Cast iron chiminea and steel chiminea are much more durable than the clay versions. Special care must be taken with the clay models during the first use and then during periods of frost. Clay chiminea models can also crack and crumble if the temperature is changing fast. This can occur when starting a fire on a cold day or a cold downpour of rain on a glowing fire. Cast iron and steel chiminea will rust very quickly, even after the first rain. This is usual and in many cases, it is a desirable effect. Although they are painted with heat resistant paint it often can’t cope with the heat generated and will burn off quickly. Cast iron chimineas can bring years of enjoyment to almost any backyard or garden, but are they the perfect choice for you? Chimineas come in three basic types – clay, stainless steel, and cast iron. Each type of chiminea will have their own unique qualities so it’s important to choose the best type for your landscape or intended use. 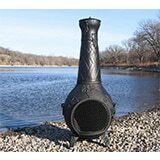 The cast iron chimineas are made from molds, allowing them to come in almost any shape or size. If you choose a cast iron model, remember one thing – cast iron is pretty heavy. If you plan on finding that perfect spot for your chiminea and never move it, the weight won’t be an issue. However, if you plan on storing your chiminea inside for the winter the weight could be a problem. What’s the Difference Between a Chiminea and a Fire Pit? A fire pit is open. There is no chimney flue over the fire. The size of fire pits varies from 24 to 40’s plus inches. You can stack this as far as the pit will hold and make a really GREAT fire. You will be able to enjoy the fire 360 degrees around the fire pit and burn regular size logs. A chiminea keeps the fire inside. The fire is in a bowl that has sides all the way up to the chimney. 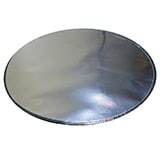 A contained bowl is usually 24 inches or so in diameter. This means you can’t burn large logs. Then chiminea construction at the top force the heat rising from a large base area to a smaller chimney and the smoke will blow out with tremendous force. This will keep your backyard from getting smoky. The chiminea will also retain a lot of heat. Cast iron is a resilient material untroubled by weather extremes, so your chimineas will serve you well for ages. A cast iron chimenea is made of standard parts which are assembled with nuts and bolts to make the product. Some products are made in one piece. Cast iron absorbs the heat of the fire, radiating it out. Cast iron is a strong material untroubled by weather extremes, so your chimineas will serve you well for ages. 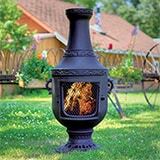 There are many models of chimeneas available to choose from, but essentially, they divide into three categories: clay, cast iron, and steel. Once you’ve chosen your chiminea’s material, it’s much easier to pick the right model for you. What type of chiminea would suit my needs? What kind of design do I want for my chiminea? Will my chiminea be inside or outside? Can I keep my chiminea outside all year? Will I need a special platform for my chiminea? These questions may seem complicated, but they all boil down to one decision that you need to make. So, what should you look for when buying a chiminea? You usually get what you pay for, and very cheap chimineas are often fairly poor quality. Cheap is usually a false economy. On the other hand, there’s also no need to spend a king’s ransom for a beautifully made, high-quality chimenea. What size chiminea do I need? It depends on the size of the space you have. Chimineas get very hot and have a bigger surface area than the fire itself and radiate all that heat out into the space surrounding it. You can also get flat-back versions that stand against a wall for convenience and extra safety. Pick the right fuel – not every fuel burns at the same speed and temperature. The heat you get depends on 3 things: calorific content, weight, and moisture. The average log has a calorific content of 16MJ per KG, coal scores 29. That’s why coal is unsuitable for chimineas. Of all the fuel types, wood is the best option. Some woods burn slow hot and clean, they are perfect for a chiminea fire. Others spit out sparks and puff acrid smoke into the air. The best wood choices for a chiminea fire include pinion pine, apple, scrap lumber, red cedar, eco logs. Do not burn pressure treated wood which emits toxic gasses when on fire. A good size range for Chiminea wood is from 9-14 inches in length and 4 inches in diameter. This size may vary depending on the size of your chiminea mouth. Chimineas must be placed on a stand if they are not manufactured with built on legs. This is essential, as the chiminea can become dangerously hot and present a fire hazard if placed directly on a floor. 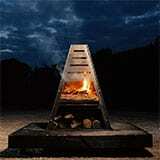 In addition to a stand, you want to place cast iron chimineas on a fire-safe base. No matter what type of base you choose, you must make sure it is level, as you do not want your chiminea falling. 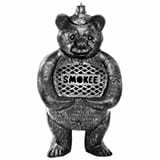 You might also consider purchasing a spark arrestor for your chiminea. 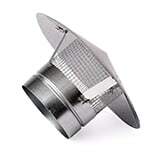 A spark arrestor is a mesh screen that you place over the chimney hole to prevent sparks from escaping. Choose a spark arrestor for the front of the fire bowl, too. Chimineas are incredibly easy to use and, once they’re burning, can retain their heat for over twelve hours. With this simple guide, you will be able to have your chiminea up and running with minimal fuss and with great results. To start, we presume you already had prepared a solid level surface for the cast chiminea to sit on. After the chiminea is level and set up on the stand, place around 2 or 3 inches of sand or lava stones in the bottom of the bowl. This provides a barrier and prevents the fire from resting directly on the bottom of the chiminea. Some users like to add a couple of bricks on top of the sand, gravel or lava stones. The wood is stacked on top of the bricks allowing a gap to form underneath. This gap allows increased airflow, creating a better fire. Make sure the inner chamber is clear of any old ash or debris before lighting a fire. If your chiminea has a lid, make sure you take it off as this will prevent air getting to the fire making it harder to light, and, if it has a grate, fix this inside the chiminea so you can start lighting your fire. Once your chiminea is prepared for a new fire, make sure you have plenty of wood to keep it burning. When lighting your chiminea, it is a good idea to place small bundles of newspaper or birch bark into the center of the chamber and light these at multiple locations. Once these have caught light create a modest pyramid out of kindling around the fire to keep it burning. Do not use chemical firelighters as these produce foul-smelling chemicals and never put any type of flammable oil or gasoline in the fire as this could create an explosion which will not only ruin your chimenea but also potentially harm anyone nearby. Keep adding to the kindling, but do not smother the fire with wood. The chiminea will begin to smoke a bit. After burning for about an hour, light a larger fire using logs or wood adding small amounts and small logs at first and building up to larger pieces of wood as the fire builds up its intensity. Allow the roaring fire to burn for another hour until you have white-hot embers inside the chamber. At this point leave the chiminea to burn, poking the embers to allow air to flow around them and keep the heat at a maximum. From here on your chiminea will continue to burn and produce heat for many hours providing you with a very comfortable heat. When you are finished with the chiminea, just let its content burn down to ash and, when cool, clean it out for the next time you want to use it. Always allow the fire inside your chiminea to burn out on its own. Never use water to douse the fire because it could damage your chiminea! Along with these tips, there are everyday things you can do to maintain the longevity of your chiminea. Clean cast iron chimineas regularly by removing the sand, cleaning the grill and interior. 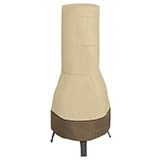 You should also purchase a cover for your chiminea to protect it from weather elements and prevent creatures from crawling inside when it’s not in use. Make sure you only use the cover once the chiminea is fully cooled. First of all, since you are using a real fire, do not put your chiminea anywhere near flammable materials. The most common mistake is to place a chiminea directly on a wood deck. If you do wish to use it on decking always place something underneath it, such a floor protector which is especially for this purpose. Make sure that the chiminea is placed away from other materials that could burn or catch fire, such as tree branches, sheds, fences, and plants. Second, never use your chiminea indoors! Despite their appearance and effectiveness at venting smoke, chimineas are only designed for outdoor use! A chiminea should be in its own area, and at a safe distance away from your home. Keep in mind that smoke will rise through the chimney, so consider anything above it like trees or overhangs. Do not put your chiminea under an awning or other outdoor covers. Make sure the chiminea is sturdy and not likely to tip over. Three or four-legged stands are available, and a foundation of brick will decrease the possibility of fire spreading. With clay chimineas, the biggest safety tip is to take the lid off. This can be dangerous as the pressure from the flames below could actually cause the chiminea to explode. Clay chimineas are fragile. In order to prolong the life of your chiminea and avoid cracks from the fire, we advise lining the base with either sand, gravel or lava stones which are special stones that will keep the hottest part of the fire away from the clay. So just drop an inch or so of sand, gravel or lava stones to prevent cracking. Finally, start with small fires. If you do not cure your chiminea by starting with small fires, then you risk cracks appearing. To prevent this from happening, just ball up some newspapers or wood sticks and let them burn out completely. Keep fires small at first, you can then build larger fires after you have done this a few times. WARNING: Supervise children and pets around the chiminea at all times. Chimineas are extremely hot and may cause burning. Do not touch the surface when in use. Before use, check to make sure your chiminea is properly seated and stable on its stand to avoid the risk of tipping while in use. It is advisable to keep a fire extinguisher in your proximity. Cast iron chimineas rust. It makes sense to store it and make sure it’s totally dry before you do it. If there are any rusty spots or areas, get rid of them with a wire brush then give it a coat of chim paint. Oil any moving parts so they don’t rust and get stuck. Stand it off the floor to help keep damp at bay. Cover it with a proper chiminea protector. Ideally, we recommend chimineas to be placed in an open area or just outside a roofline allowing them maximum airflow and ventilation. However, it really depends on your individual situation. Take a look at these FAQ to see if we’ve answered your queries and concerns. How Do I Choose A Chiminea? As we explained in this article, there are a lot of things to consider when buying a chiminea. If you’re looking for a new chiminea to replace a damaged model, you already have an idea of what you’re looking for, but it’s still a good idea to look at all the options on our Top 10 before making a decision because there are often exciting new designs and models available. What Chiminea Size Do I Need? Chimineas come in many shapes and sizes. If you are the happy owner of a large garden or patio, why not try an extra large chiminea? A large chiminea fits perfectly in a medium-to-large garden. If you just want to brighten up a corner of your patio, try a small chiminea. Whichever size you decide to go for, make sure that you have a firm, level, fire-resistant surface to put it on. If you’re putting your chiminea on decking or another wood surface, ALWAYS use a floor protector to prevent sparks damaging the wood! Cast Iron, Steel or Clay Chiminea – Which Is Best? 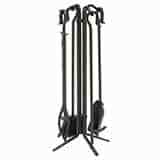 Cast Iron Chimineas – very sturdy, durable. They perform excellently as heaters and are great for occasional BBQs. Nowadays, many come with an integral swing-out BBQ grill. The cast iron makes these chimineas heavy for their size, but they will store heat for a long period of time so they’re remarkably efficient for heating. The downside of cast iron is that you need to protect it against rust. Apply a fire-resistant finish or paint, an easy job that does not require high skills. 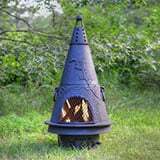 Steel Chimineas – lighter than cast iron, steel chimineas are good at radiating heat and for cooking. As a plus, they are modern in design and less prone to rust, although they still need to be protected from bad weather. We recommend purchasing a cover set. Clay Chimineas – they are the traditional option. Clay chimineas soak up the heat of the fire and radiate it really well. Made of thick clay, are heavy and should constantly be protected from bad weather. They usually don’t come with grills, but you can buy removable grills and cooking accessories. Clay chimeneas are fragile, will crack easily. Chimineas are great to dispose small quantities of dry garden or household waste. Don’t burn plastics – they can be toxic and dangerous as well as horribly smelly and smoky. Wood is great for burning. Cedar, pine, apple, and hickory are a some of the most popular chiminea woods, but whatever wood you burn you should always make sure it hasn’t been chemically treated (stay away from pressure-treated wood and parts of manufactured logs). Do not burn pellets in your chiminea, as they are manufactured specifically for wood stoves and they tend to burn very hot and leave a lot of ash. 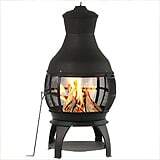 Most cast iron chimineas manufacturers also do not recommend burning charcoal in your chiminea. NEVER use gasoline or petroleum-based accelerants to help start a fire! Try to avoid green woods, as they will create a great deal of smoke and very little fire. Are Cast Iron Chimineas Dangerous? Some companies suggest that cast iron chimineas are dangerous because of the high temperatures they reach. It’s obvious that a cast iron heater gets hot and will radiate more heat over a much greater area. If you want to play safe, opt-in for a clay chiminea that will look great, but will not provide anywhere near as much heat, and is likely to crack and possibly fall apart after a very short time. Use good common sense and safety practices when you’re using your chiminea – you are handling fire, after all. Do I Need To Spend A Lot Of Time On Maintenance? Cast iron will require more love than steel, just because of the properties of the metal and their corrosiveness. These accessories are absolutely essential. You need them to stay safe and make sure your chiminea lasts year after year. A cover stops your chiminea rusting away through the winter. If you have a cast iron model, it means you can keep it protected without moving it indoors. They’re waterproof, UV resistant, they don’t tear and they’re shaped to fit perfectly. Important point: never cover a wet chiminea! This seals the moisture in. Make sure it’s thoroughly dried first. Made from three heavy duty sections that disassemble for easy storage. Use for extra protection for curious children or pets. Easily slides forward to add wood. This stove paint comes in a spray, in different colors. The job’s done in seconds. 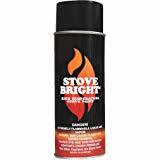 Made with a silicone protectant, this fine stove paint is rust resistant, resists scratching and marring. Tested to 1200 degrees. One can covers approximately 15 square feet. 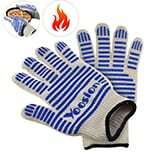 These gloves protect your hands – useful if you ever have to reach into the fire, or touch a hot chiminea for any reason. Double layer design, thickness 50 percent up, 662 F degrees heat resistant,. Includes stand, poker, shovel, brush and log tool to keep the fire burn and clean up a chiminea. 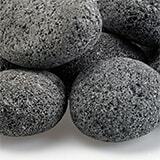 Use pumice stones to line the bottom of any chiminea. For large size chimineas you’ll need 2 bags – for all other sizes just 1 will be enough. And there’s no need to buy another bag ever again. These stones can be used over and over. Do you have decking? If so, you’ll need one of these. A floor protector stops rogue sparks from damaging the wood. It also prevents it from catching light. Available in 2 sizes: 24 or 36 inches diameter. Tops off the chimney system,helps to retain sparks and embers, and protects the chimney opening from infiltration of weather, debris, and animals. Cast iron chimineas can be a great addition to backyards. They are sturdy, generate a lot of heat and can last for long years with the appropriate maintenance. The chiminea type you choose ultimately depends on your use and expectations. Chimeneas have become very popular and can add excitement and character to almost any place.